Bolivian peak of Huayna Potosi 6,088 m.a.s.l. is located near La Paz. 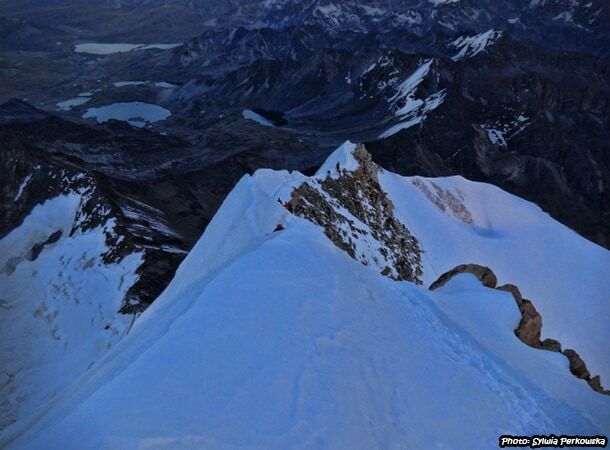 It is one of the easiest more than six thousand meters summits to achieve. If you want to see and feel on your own skin what it’s like to be at such a height, including how and whether our body tolerates such altitude, it is definitely worth to pick up the gauntlet. 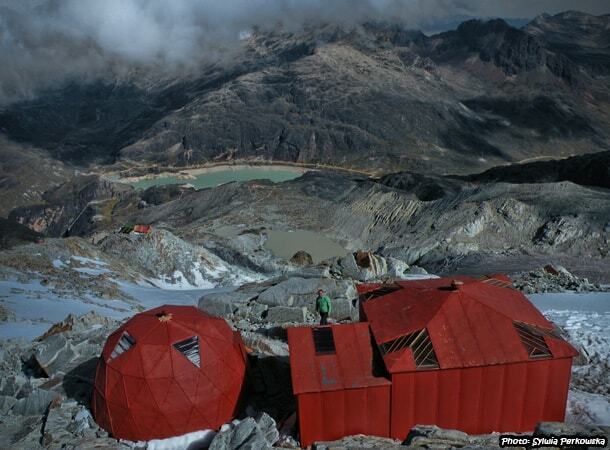 Is actually Huayna Potosi mountain almost for everyone? Well I think that yes. 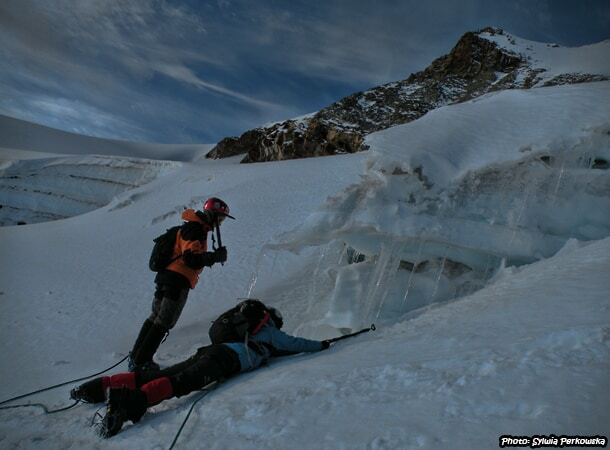 To reach the summit you do not have to have climbing skills or the experience with the use of crampons. You just need to be in good physical condition and to be ready to walk around 8-10 hours in snow, for sure strong will and of course desire do this kind of pleasures. And definitely if you have any health problems, before you will decide to climb any high mountain, consult this kind of adventures with the doctor. 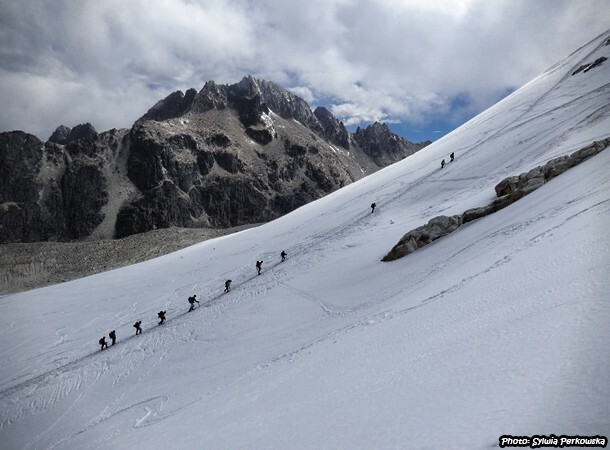 There is I think only one difficulty connecting with climbing Huayna Potosi, I mean altitude. But it is tough to say if it will be hard for you or not, till the moment you will try to climb high summits. Each one reacts differently, in another moment has crisis, different pain. Some people do not have any problems with height, some have at the last part of the trip, some in the middle, or even at the beginning. This issue is always a great surprise. In my opinion strong will and determination can help a lot in this kind of situations, but of course if you will start to have strong pain, sometimes it will mean the end of the trip. 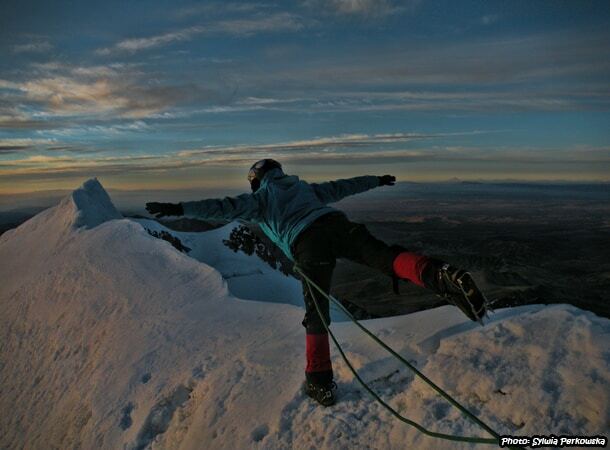 When, with whom and for how much it is possible to climb Huayna Potosi summit? The best time to climg Huayna Potosi is from May to September, although I was visiting Bolivia in early November and I reached the top. But definitely it was the last moment to do this tour. The next days the weather changed a lot and it was impossible to climb this summit. There are a lot of companies with which you can organize the trip, but be careful, because the companies and the quality of the services are no equal. I recommend the one which has its own lodges on the way to the summit. I do not remember the name of the company, but I think it was Huayna Potosi agency. Just you need to know that there are at least two other companies who use the same name. Just always ask whether they have their own, private base and who is the owner of the company. If the answer to the first is yes, and to the second that it is the doctor, then you can buy the tour. 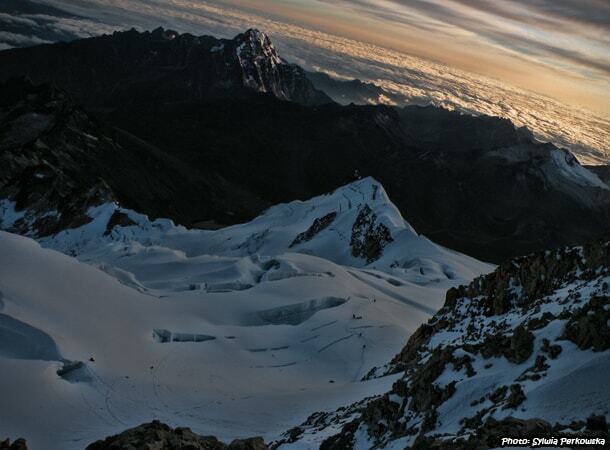 And how much does it cost to climb Huayna Potosi. Actually it was not so expensive. I paid 900 bolivianos, the rest of the team paid 950. I bargain more and I used as an argument that I have my own sleeping bag, what worked. There is also one other issue to think about, before choosing the tour. Namely you can find the offers of the tour with 2 or 3 days option. I recommend you to choose 3 days option. The price is almost the same so you will not save to much money if you will buy 2 days tour. And for sure if you will decide to take longer option you will have extra day for acclimatization and additional half a day of climbing course. I decided to buy the tour with 3 days and I was very happy for this choice. The company has its own very nice lodges. First one is quite a big house and second one is a small base, but I liked it too. Our time had a great time there. And I did there my first climbing course, what was a really nice experience. I highly recommend longer option for everyone who has never tried climbing before. 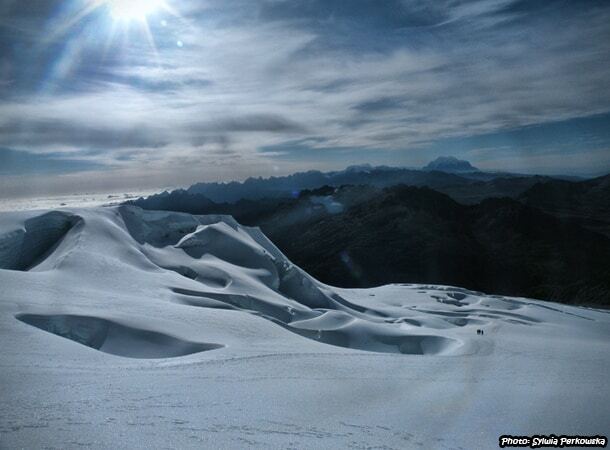 How many hours you will have to hike and climb before reaching Huayna Potosi? The first day is easy. 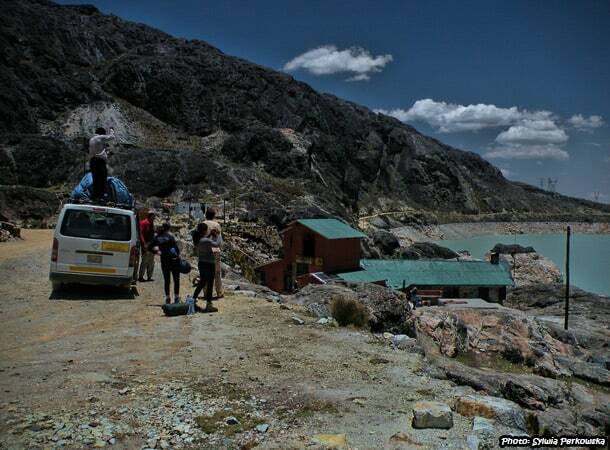 You will go by bus from La Paz to the first base (what will take around 2 hours). After a while you will have a climbing course nearby, with all the equipment. The second day is a little bit hard, because you need to go to the second base camp which is situated on around 5200 m.a.s.l. On this day you will have to carry all your equipment, what will not make your trekking easier. The good thing is that you can hire a porter to do it (the cost in 2013 was around 100 bolivianos). I decided to go with the bag on my back, but I have to admit, that I had some problems on the way. I was very tired and I felt sick. But finally somehow I found extra energy to finish this part. The thing which surprised me was, that the next part, from the second base to the summit, I did not have any problems. Probably my body got used to the altitude and the extra effort. The hike to the second base camp took as around 5 or 6 hours. We arrived there around 3:30 pm and the rest of the afternoon we tried to rest and sleep. Actually I could not sleep a wink. My friends from the team had the same problem. For sure it was connected with the altitude. The attack of the summit we started at midnight. Unfortunately two of our friends had to finish the tour 10 minutes after leaving the second base, because of the altitude sickness. The rest of us were continuing the climbing and we finished with success. It took us more than 6,5 hours to reach the destination. On the top everyone felt wonderful. I was very proud of me, because it was my first climbing and first time so high. I was the last person who left the summit. I loved the view from the top so much, than I just did not want to come back to the base. Finally, very happy and relaxed I started to come back. During that part we could admire a beautiful landscapes and take pictures, what was impossible earlier because of the dark. We even had one extra adventure. By accident I lost my helmet, which rolled to a big hole. Fortunately we managed to rescue it. It took us around 2,5 hours to get down to the second base, where we rested a little bit, drank hot tea and after a while we went to the first base. This part took as another 3 hours. In the first base we had a very delicious lunch after which we packed our equipment and we came back to La Paz. Our expedition full of positive impressions finished in the evening. We were tired but also ready for the next adventures. 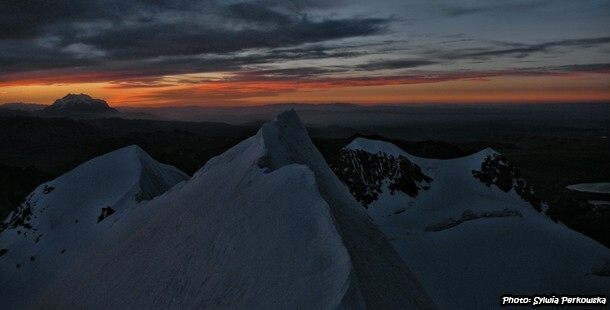 If you will have possibility, try to climb Huayna Potosi summit. You will have a lot of fun. Just please remember about the acclimatization before starting the trip. 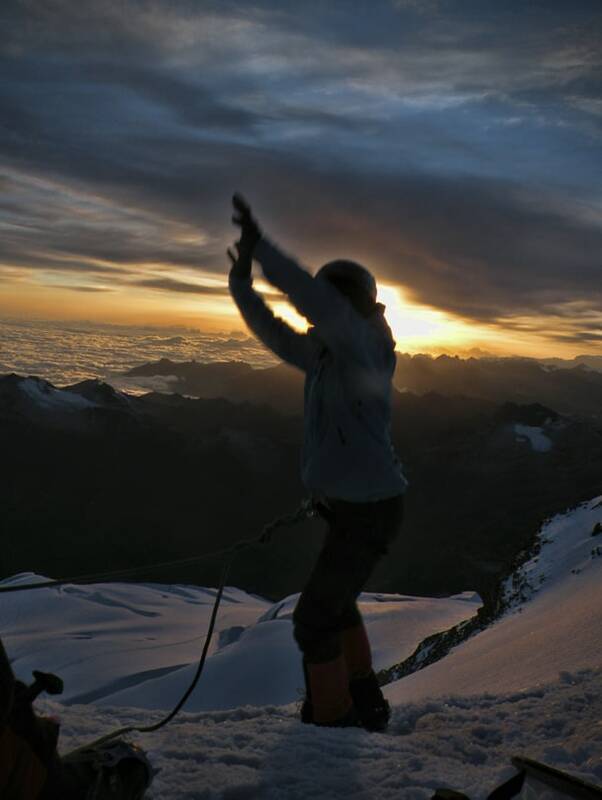 If you are interesting in climbing hight mountains in Peru, check my articles about climbing Tocllaraju mountain and Yanapaccha mountain. Lindo articulo. Acabo de volver de la Argentina y en el avion, lei un articulo del Wall Street Journal (nov 19, 2016) sobre como escalar el Huayna Potosi. El autor sugiere lo mismo que vos: que no es TAN dificil. Yo solo he escalado Mt. Shasta, CA (4.321 metros) hace unos anos. Espero algun dia hacer cumbre en el Huayna Potosi. estoy muy contenta que te gusta este articulo. Si quieres escalar una montaña mas grande y con nieve, Huayna Potosi es muy buena opcion. Es muy facil, porque esta montaña no es tecnica. Primero de todo lo que necesitas, es una buena aclimatación.